You are all invited to my Community Recording Session at the Village Ballroom, this Wednesday, June 19 from 9:30-11:00am. I’m in the process of recording an album of animal folk songs that I’ve collected and adapted over the years. The album, called The Deep Woods, is nearing completion, but now I need your help! 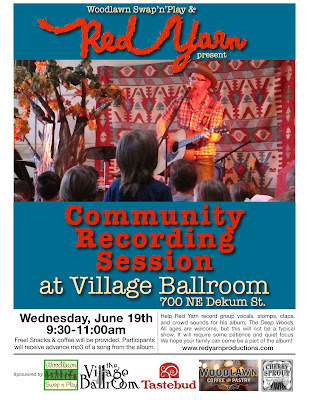 Join me on Wednesday morning to record group vocals, stomps, claps, and crowd noises. The Village Ballroom (700 NE Dekum St.) has generously donated their lovely space for us to use, and the wonderful folks at Woodlawn Swap’n’Play are co-hosting. This is a FREE event, with bagels, fruit and coffee donated by Tastebud, Woodlawn Coffee & Pastry, and Cherry Sprout. Participants will also receive an advance mp3 of a song from the album. All ages are welcome, but please note that this will not be a typical Red Yarn show. It will require some patience and quiet focus as we work through each song. If you and your children enjoy singing, stomping and clapping at my shows, then I would love to have your voices on my record! See the Facebook event and flyer below for more info, and please spread the word! Thanks for your support, and I hope to see you on Wednesday! http://redyarnproductions.com/wp-content/uploads/2016/04/bright-red-logo-for-web1.jpg 0 0 Red Yarn http://redyarnproductions.com/wp-content/uploads/2016/04/bright-red-logo-for-web1.jpg Red Yarn2013-06-17 06:50:002013-08-09 15:45:54Community Recording Session!